abbreviation for basic life support. Any technique, therapy, or device that assists in sustaining life. 1. Treatment for managing a critically injured patient. 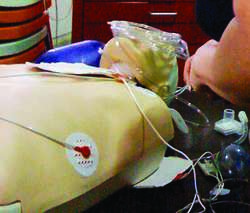 The phase of cardiopulmonary resuscitation (CPR) and emergency cardiac care that either (1) prevents circulatory or respiratory arrest or insufficiency by prompt recognition and early intervention or by early entry into the emergency care system or both; or (2) externally supports the circulation and respiration of a patient in cardiac arrest through CPR. When cardiac or respiratory arrest occurs, basic life support (BLS) should be initiated by anyone present who is familiar with CPR. 1. A level of out-of-hospital emergency service. The treatment, including basic and advanced life support, for stabilizing a critically ill or injured child. Abbrev. for basic life support. Q. How the fetus is influenced from Bloom syndrome? If the mother has the syndrome, what is the influence on the fetus? For its macroeconomic projections, BLS uses a system of equations that constitute a structural econometric model of the U. Success will be measured in a BLS that is more flexible, modern and responsive, preserves quality, and provides more value for each tax dollar. BLS also derives the weights for each commodity that is included in an industry input index from this data table, in conjunction with U. Despite repeated attempts, BLS officials could not be reached for comment yesterday. I also worked as a peer mentor in my school's nursing laboratory for the last two years of the nursing program and observed students practicing other nursing skills, but never their BLS skills. Additionally, BLS will make tiered, royalty payments of up to 30% on net commercial sales of products containing istradefylline. One hundred percent of students either strongly agreed or agreed that the BLS training increased knowledge of BLS standards, the BLS instructor facilitated their learning and respected their needs as learners. Indeed, BLS and CPR are a competency required in many undergraduate health care courses. The arrival of the BLS Wagon in UK showrooms, in the last quarter of 2007, will mark yet another first for the American luxury brand. And Cadillac launching an estate version of the BLS isn't exactly going to change things. Cadillac's attack on the UK and Europe will gather extra momentum towards the end of the year with the arrival of a new load(lugging version of the BLS executive model. When it was launched last year, the BLS was Cadillac's first ever front wheel drive car and became the first Caddy ever to be powered by a diesel-engine.